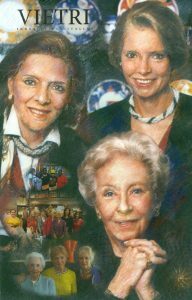 Lee S. Gravely and her daughters Susan and Frances own the company, VIETRI, Inc. The company was inspired by a trip mother and daughters took to Italy in 1983. VIETRI, Inc. has grown into the largest Italian importing company in the American table-top industry. It has been named one of the top Forty Family Friendly Companies. Its founders have received local, national and international recognition. Their accomplishment is an inspirational entrepreneurial story of turning a personal tragedy into an international business success story.